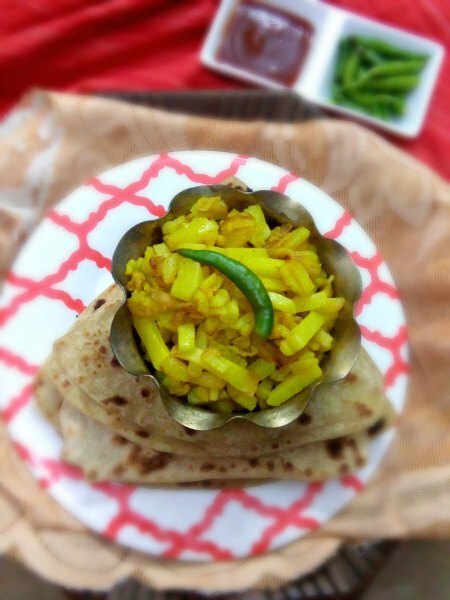 I want to share an absolute favorite flatbread recipe of Bengalis on the occassion of Bengali New year 1424 which is just around the corner. It falls around 14th or 15th April every year. This year it'll fall on 15th of April. It's a very eventful and important day for Bengalis like other communities in India. First day of the first month, Baisakh, which is popularly known as "POILA BAISAKH", where poila means the first. The people of Bengal celebrate with lots of excitement and zest and welcome the new year with lots of enthusiasm. The day starts with "early morning processions" where men and women sing "Rabindra Sangeet" and other regional folk songs where men are dressed in traditional Dhuti-Punjabi and women are dressed in white Sari with red border, very significant to Bengal. Lots of people visit temples to start the new year with god's blessings. Goddess Lakshmi, the goddess of wealth, and Lord Ganesh are worshipped on the Bengali New Year day. It's an auspicious day for traders and businessmen. Traders perform the "halkhata" ceremony that means shopkeepers, businessmen and traders close their old accounts and open a new one. All shops are decorated with flowers and Sola decorations and also stringed fresh lemons and chillies hanging in front of shops. This is to ward off the evil eye. People visit their favorite shop during the day to wish them luck for the year ahead and traders welcome customers on this day with sweets and a Bengali New Year calendar. Baishakh is one of the important month for the Bengalis as it marks the beginning of the crop cycle in Bengal. Every Bengali will wear new clothes to celebrate this joyous occassion. Lots of cultural programmes are held on this day. Shantiniketan (Rabindranath Tagore's Viswa Bharati University) celebrates Poila Boisakh in a grand way, involving many cultural programes. No occassion is complete without good food. All favorite delicacies are prepared that day at every home, even restaurants fill their menu card with only traditional bengali delicacies for that day. Exchanging of gifts among friends and family, typical plush Bengali lunch, the pungent smell of new dress epitomizes the Bengali New Year as one of the most significant event of the year. I am just eagerly waiting for that day this year too with the same excitement like I used to wait as a kid for this day to come. New year gives us so much new hope, new beginning, new excitement and new happiness, isn't it ? This very same day is celebrated as a New Year not only in Bengal, but also this following states in India( Kerala, Manipur, Nepal, Orissa, Punjab, Tamil Nadu and Tripura) and different pasrts of South Asia, too(Sri lanka, Bangladesh , Cambodia, Laos, Myanmar, and Thailand). Isn't it wonderful? A happy and prosperous new year wish from me to all the peoples from these countries. 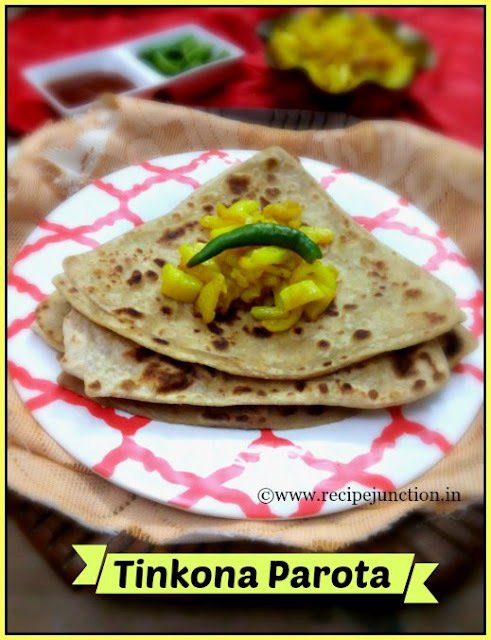 As I said earlier, I want to share a flatbread recipe, which we call Tinkona Parota (Triangular Paratha). 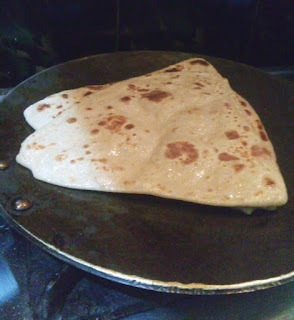 It's just like regular Indian paratha but it's Bengal's speciality that we make the paratha in a shape of triangle. 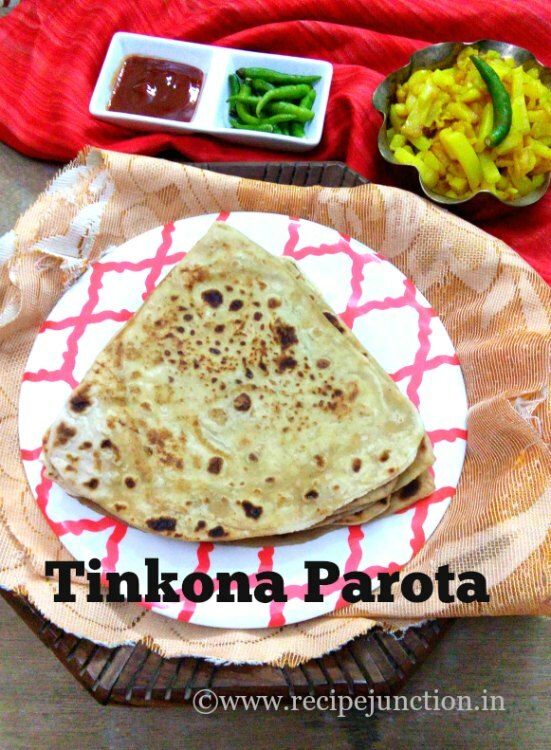 Paratha is an Indian flatbread that is fried with little oil or ghee. Traditionally, Bnegali Tinkona parathas are fried with ghee but nowadays people try to avoid ghee for its fat content but it tastes best with ghee. I do not completely compromise, so make a mixture of vegetable oil and ghee and fry my parathas with it. So, my parathas are full of flavour and health, too. Also, most people make parathas with all purpose flour, but I make my parathas with whole-wheat flour and it doesnot taste bad. 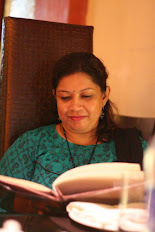 Bengali Tinkona Parotas are best enjoyed with Aloor dom, Aloo Charchari or Aloo Bhaja. This time I made with Aloo Bhaja and it was just divine. Vegetable oil: 1 tsp. + 2-3 tblsp. Ghee (clarified butter) : 1 tblsp. Making the dough :: Take both the flour and salt in a big bowl. At the center of the bowl pour oil. Rub the flour with oil till it resembles breadcrumb. Slowly start adding water and mixing till the dough is formed. Knead with the heel of your palm some more to make the dough soft and springy. Let it rest for 30 minutes before you start making the parathas. Divide the dough in equal sized balls and smoothen the outer surface by rolling them between your palms. 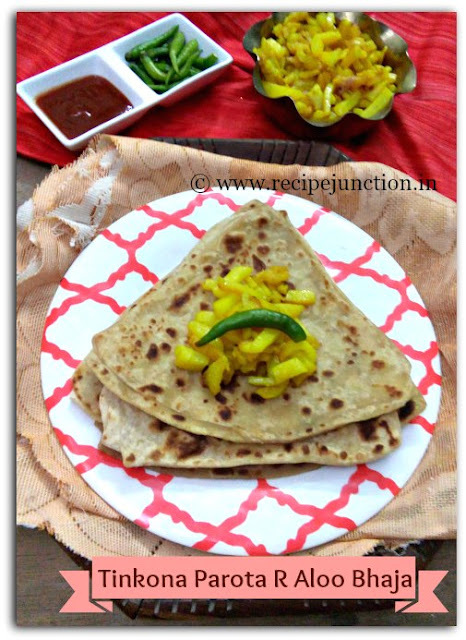 How to roll the Parathas :: You can roll out parathas on a rolling pin adding oil or dusting with flour, whichever is easier for you. I prefer to make them with flour. See the collage for reference. (a) Take a small dough ball and flatten a bit on rolling platform. [pic1] (b) Roll out a medium sized circular disk.[pic. 2] (c) Sprinkle little flour on upper surface of the circular disk. (d) Fold along the diameter in half circle. Again sprinkle some flour on top. [pic.3] (e) Fold again in a triangle.[pic. 4] (f) Roll out the triangle on all sides to make a triangular shaped paratha [pic.5]. The thickness would be similar to regular paratha. Roll the other balls in similar manner. Frying the Parathas :: In a small bowl, take 2 tblsp. vegetable oil and 1 tblsp. melted ghee and mix, we'll fry the parathas with these mixture. To cook the parathas, heat a griddle or a flat pan and place one or two to three parathas at a time. For each paratha, cook for a minute on one side, then flip it. Cook the other side till it cooks and small brown spots appear. Now brush these oil & ghee mixture on both sides of the paratha and drizzle few drops of oil from the sides. Press the parathas to make sure its cooked through. Flip and repeat the process for rest of the Parathas. You can place the parathas on a kitchen tissue paper to absorb the extra oil. Enjoy with anything you like...I love it just with sugar 😀. Also best enjoyed with Aloo dum, Aloo charchari, even with simple aloo bhaja(potato fries).